MARY MAGDALENE will be released across Australia on 22 March. Ahead of the release, Transmission Films are delighted to announce that the film’s director Garth Davis will take part in a series of Q&A events in early March in Sydney, Brisbane and Melbourne. 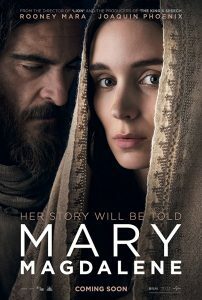 MARY MAGDALENE is Garth Davis’ second feature film after the incredible success of LION last year, and it stars Rooney Mara as Mary Magdalene and Joaquin Phoenix as Jesus, with Chiwetel Ejiofor as Peter and Tahar Rahim as Judas. The film is produced by See-Saw Films, the company behind Lion, The King’s Speech and Top of the Lake. Set in the Holy Land in the first century, MARY MAGDALENE is the story of a young woman who leaves her small fishing village and family to join a new movement. Inspired by its charismatic leader, Jesus of Nazareth, and his teachings, Mary sets out with the disciples on the journey to Jerusalem, where she finds herself at the centre of the founding story of Christianity. MARY MAGDALENE brings a unique and fascinating character to the fore and places her at heart of the greatest origin story of all.